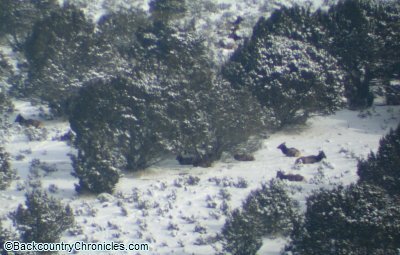 Photo of elk taken through our spotting scope at about 1,500 yards from window in our house. We live in a place where we can still watch deer and elk from our house. 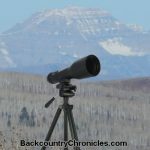 At night, both elk and deer slip down into the pastures, alfalfa fields and the last few undeveloped sage areas on our side of the valley to feed. The deer also come into our yards to feed on the trees, shrubs and garden plants. The elk usually stay away from the houses and it has been several years since we have seen elk tracks and droppings in our yard. As soon as it starts to get light in the morning, both elk and deer head back up on the slopes and ridges. Some days, the elk rest on the steep south-facing slope where I can watch them for most of the day and other days I am lucky to catch a glimpse of them just after sunrise as they climb the the hillside or the ridge and before they cross over the top. The deer and elk should be resting down here in the valley, but my house and everyone else has been built in what used to be prime wintering habitat for all wildlife. Recently, I counted 60 elk up on the mountain side and then we counted 65 sets of tracks in the snow a few days ago near the house. The deer and elk are lucky to still have this habitat and we are lucky to still get to watch them. In 2008, the 2,000 acre ranch to the east of our neighborhood was sold to two developers. We thought that the elk would be gone by now, but after the housing market crash, construction slowed at one housing development and completely stopped at the other after the developer went bankrupt. While the fallout from the crash has hurt most of us in many ways, it has been a good thing for the mule deer, elk and the many birds and small wildlife that still use the area. But make no mistake about it, the days are numbered for this area as viable habitat; Summer or Winter. The entire area that I can see from the house is private property. We used to hike up on the mountain and look for antler sheds when the area belonged to the ranch, but now the area is posted and the largest development actually has rent- a-cops that patrol the property. We still walk on the section next to the house that is owned by the bank. Recently, we can see more new houses being started in the development as well as other parcels of land that have been undeveloped until now. We have been told the bank-owned property will start development again next Summer. Depending upon how much of the vegetation gets destroyed, this may be the last Winter the deer and elk can use this area. 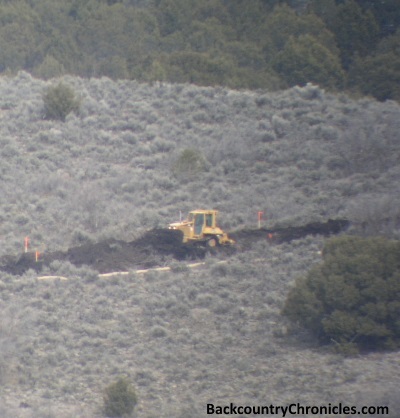 First road being cut across elk a mule deer Winter habitat. Update: The inevitable has happened… the first road has been cut across the ridge where the previous photo of elk were taken. This photo was also taken about about 1500 yards through a spotting scope. The road was cut above the elk in the previous photo and across the hill to the left. There are many factors contributing to the recent declines of mule deer populations throughout the West. Many of these factors are related to changes in habitat, including overgrazing and fire suppression, but human population growth and the subsequent habitat conversion by development can not be ignored. In the little valley, where I live, there are currently over 27,000 people (2014 estimate) living in nearly 12,000 “units” as defined by the U.S. Census Bureau. You can see from the table below how fast the population has grown and how fast development is taking place. The story is the same in almost every small towns throughout the west. In every valley, every new house, business, golf course, storage unit, road, reservoir or park replaces critical winter habitat. We can’t control the snow pack or the rainfall. We can argue about different strategies for managing wildlife populations, but almost everyone agrees that the minimum carrying capacity of a population is determined by the quantity and quality of Winter habitat. At some point, the land near my house will become so developed that the elk will stop coming. The deer will still come around for a while, but the area will only be able to support a portion of what it used to support. Just like the old timers here talk about how the elk used to winter in a barn 10 blocks east of Main Street, we will reminisce about the elk and deer we used to see here. There are 1,200 houses planned for phase one of the housing developments, all of which will be built in winter habitat. I can’t imagine a single deer will remain by then. Our property values will probably rise, but our quality of life will fall. While I sit here and wonder what could have been done, I hear the sounds of new construction. Houses are being built. By the time 1,200 houses are built, all those new people will need places to eat, buy supplies and to play, so more restaurants, stores and recreational areas will also be built. By then, we will probably need a new reservoir and the sewer plant will need to expand. Then Phase Two will begin and this is just on my corner of the valley. The same thing is happening all over the valley and it all adds up. Maybe I should say it all takes away. My family has been hurt by the economic downturn. The value of our house has fallen by a third and we lost a primary job, yet we still celebrate the fact the development slowed and the deer and the elk remain. We have seriously cut back on our spending, but for now, we can still afford to choose quality of life over quantity of money. It is a shame that for wildlife to win, the economy must lose. The wildlife professionals have been trusted to manage our wildlife populations and to maintain those populations for future generations. If they believe economic growth and wildlife conservation are incompatible, what is their plan to fix it? As development booms, the wildlife professionals in my state seem focused on treating habitat and managing buck to doe ratios. I agree those things are important, but to my knowledge, there has been very little acquisition of land or conservation easements in recent years. Somehow, we have to find a way to conserve our wildlife populations despite the fact that most people will continue to choose the economy over conservation. What do you think is the best solution to preserving wintering habitat?